For years iOS users have been wishing, hoping, and dreaming for ways to see information inside apps without actually launching them. For instance, wouldn’t it be nice to see the current weather forecast without even opening a weather app? How about reading a few of today’s news headlines without opening a news app? Many thought Apple would never execute this type of functionality. Now with the latest version of iOS they have introduced these longed-for widgets, although maybe not in the format people were expecting. Check out our list of the best iPhone widget apps below. This article is part of our Best iPhone Apps series where we categorize the best apps for iPhone and iPad. Click here to find out more. Apple has utilized the “Today” screen in Notification Center to display widgets. You can access Notification Center by swiping down from the top of your iPhone or iPad screen. Tapping on the “Today” tab shows you today’s date and maybe some information from your calendar. But now you’ll be able to add more widgets to see information from apps without even opening them. What I really like about Apple’s approach here is that you can access these widgets by swiping down Notification Center from anywhere, even without unlocking your phone. 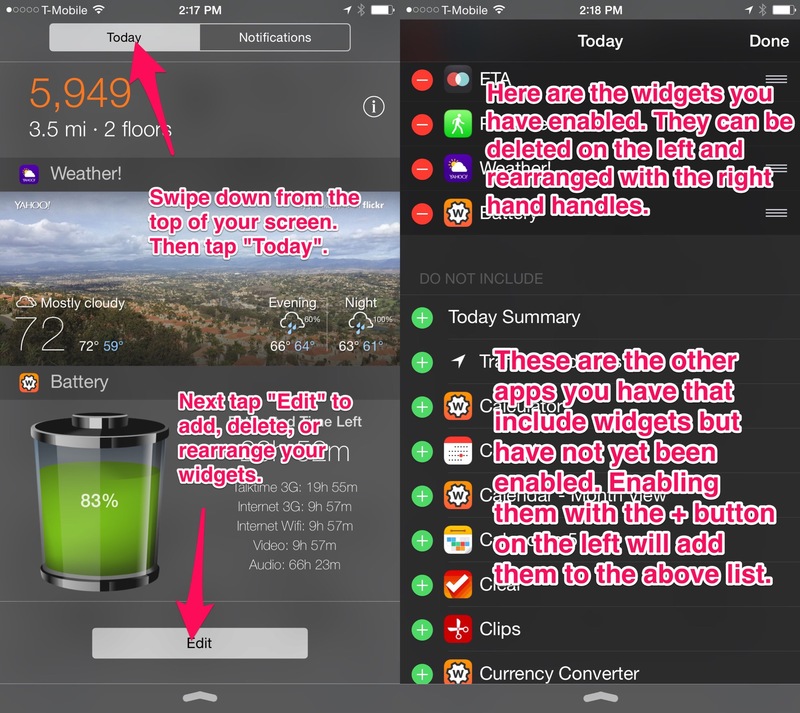 Here’s how to add a widget to Notification Center. The video above will show you how this all works but you can also follow these directions. Swipe down to open Notification Center. Now tap the “Edit” button at the bottom of the pane and you’ll now be able to add widgets to Notification Center. The list of widgets that appears is based on apps you have installed on your iPhone that support widget functionality. You can tap the + button to add these app’s widget to Notification Center. Tapping “Done” in the upper right will take you back to Notification Center where you will now see your newly added widget. If you want to get new widgets, you first need to download apps that support this functionality. We’ve been using tons of widgetized apps since they’ve been made available. Here is a list of the best widgets for iPhone and iPad. Take a look and let us know your favorite widgets in the comments below. This list will be constantly updated as cool widgetized apps are released on the App Store. In the meantime, let us know your favorite widgets for iPhone and iPad in the comments below! Is there a widget for reading the daily text? Unfortunately, I haven’t seen one. But that’s a good idea.